Modern touch lamp finished in antique brass with an opal glass shade. Antique brass finish touch lamp base, with a flexible stem and lamp head holding an opal glass lamp shade. Ideal as a desk lamp or as a bedside reading lamp. No more fumbling in the dark looking for the switch. It has never been easier to find the right desk lamp for your home or office. 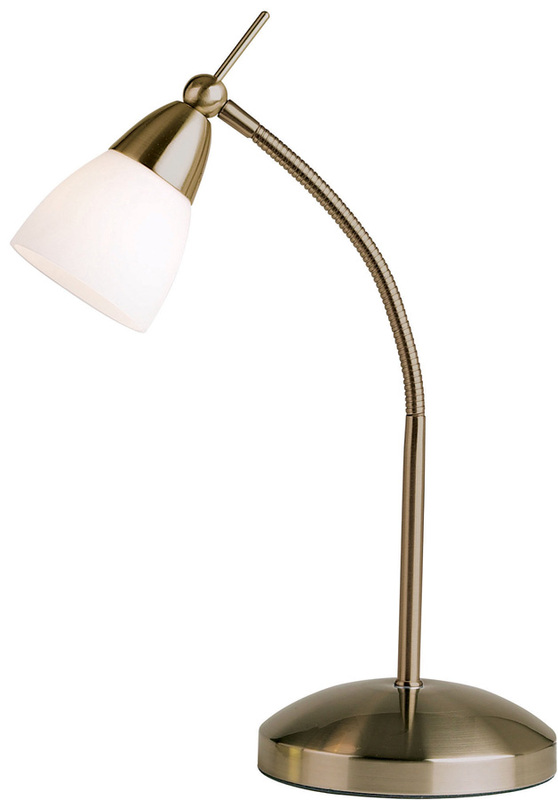 At Universal Lighting we have a fantastic choice of lamps designed for desks. Browse our selection today for the perfect lighting addition to your work environment. Hello Diana and thank you for the question. The antique brass touch table lamp takes a 40w G9 halogen capsule that is supplied with the fitting. You may order online or we can take the order from you over the telephone. We are open tomorrow, Saturday from 10am until 4pm and can be contacted on 0151 650 2138.